2 n AudioFile/www.audiofilemagazine.com © 2018 by AudioFile ® Publications, Inc. All rights reserved. ISSN 1063-0244. 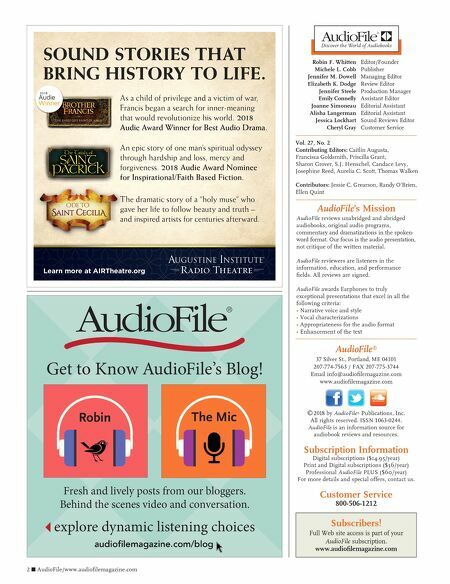 AudioFile is an information source for audiobook reviews and resources. Subscription Information Digital subscriptions ($14.95/year) Print and Digital subscriptions ($36/year) Professional AudioFile PLUS ($60/year) For more details and special offers, contact us. Customer Service 800-506-1212 AudioFile's Mission AudioFile reviews unabridged and abridged audiobooks, original audio programs, commentary and dramatizations in the spoken- word format. Our focus is the audio presentation, not critique of the written material. AudioFile reviewers are listeners in the information, education, and performance fields. All reviews are signed. AudioFile awards Earphones to truly exceptional presentations that excel in all the following criteria: • Narrative voice and style • Vocal characterizations • Appropriateness for the audio format • Enhancement of the text AudioFile ® 37 Silver St., Portland, ME 04101 207-774-7563 / FAX 207-775-3744 Email info@audiofilemagazine.com www.audiofilemagazine.com Subscribers! Full Web site access is part of your AudioFile sub scription. 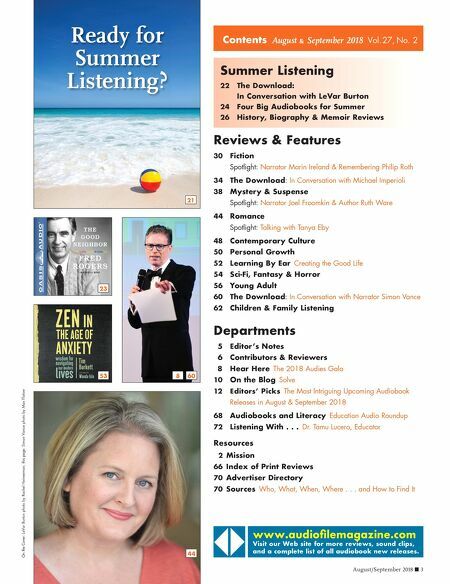 www.audiofilemagazine.com Discover the World of Audiobooks Editor/Founder Publisher Managing Editor Review Editor Production Manager Assistant Editor Editorial Assistant Editorial Assistant Sound Reviews Editor Customer Service Robin F. Whitten Michele L. Cobb Jennifer M. Dowell Elizabeth K. Dodge Jennifer Steele Emily Connelly Joanne Simoneau Alisha Langerman Jessica Lockhart Cheryl Gray Vol. 27, No. 2 Contributing Editors: Caitlin Augusta, Francisca Goldsmith, Priscilla Grant, Sharon Grover, S.J. Henschel, Candace Levy, Josephine Reed, Aurelia C. Scott, Thomas Walken Contributors: Jessie C. Grearson, Randy O'Brien, Ellen Quint SOUND STORIES THAT BRING HISTORY TO LIFE. As a child of privilege and a victim of war, Francis began a search for inner-meaning that would revolutionize his world. 2018 Audie Award Winner for Best Audio Drama. An epic story of one man's spiritual odyssey through hardship and loss, mercy and forgiveness. 2018 Audie Award Nominee for Inspirational/Faith Based Fiction. The dramatic story of a "holy muse" who gave her life to follow beauty and truth – and inspired artists for centuries afterward. Learn more at AIRTheatre.org Get to Know AudioFile's Blog! audiofilemagazine.com/blog explore dynamic listening choices Fresh and lively posts from our bloggers. Behind the scenes video and conversation.